This weekend I painted Vendel Miniatures goblin king. I actually based and primed this guy over a year ago. I was going through my shelves, found the mini, and felt sorry that I hadn't painted him after all this time. The king's crown was damaged when I bought him, but this doesn't bother me too much since we all know goblins don't take good care of their stuff. The old Grenadier Fantasy Warriors range (now sold by Mirliton) and Vendel Miniatures (now sold by Sgt Major Miniatures under the name "Bloody Day") are my favorite manufactures for fantasy models. I just love their models' heft proportions. The SGMM website design is pretty horrible, but it's worth checking out their old Vendel models. Hi, Ferrous: I like the look of the painted mini. Varing colors of leather, etc. Hey, are the King's teeth green, or is it his tongue I am seeing? Keep up the good work and happy gaming! @Baron I was lucky to buy up a bunch of Vendel's minis in an eBay auction a few years ago. I almost ohave one of each pack they sold. @Jay That's not his tongue. It's his lower lip. I also painted up a bunch of Dwarves in the Black and White colour scheme that Vendel used in their adverts. I am sure that I sold them at a bring and buy. WHich size are Vendel miiatures? Are any comatibility wuth 1/72 figures? The Vendel figs are 28mm, so they aren't a good fit for 1/72. You should look at Splintered Light's fantasy range. They are 15mm, but some of them look very good with 1/72 models. 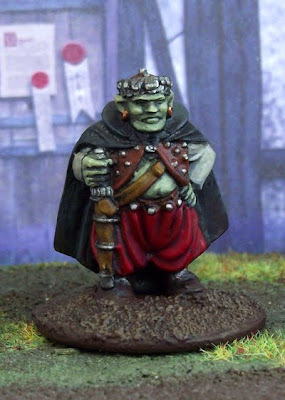 I bought some of their goblins to go with my Caesar 1/72 orcs.